Police car on the sidewalk outside the Chicago Bee Branch Public Library. In the vestibule of the Chicago Bee Branch Library at 3647 South State Street, a painting extends from wall to wall over the entrance. It evokes a busy street scene during the heyday of the Black Metropolis—the African-American city-within-the-city created by the interplay between waves of Southern migrants and rigid patterns of Northern segregation. When one looks closely at the painting, it is apparent that it represents the two block stretch of South State Street on the other side of the library door. Central to the cityscape is the pale green Art Deco building in which the library is located. Commissioned in 1929 by Anthony Overton, it was the home of the Chicago Bee, a newspaper published by Overton that competed with the Chicago Defender. Also prominent in the painting is the other surviving landmark on the street, the Overton Hygienic Building, a block to the north, which originally housed a cosmetics company. Between these two anchors, there is a shoe repair shop, a men’s clothing store, a cleaner, a “general merchandise” store, a restaurant and bar, a cab stand, a women’s clothing store, a meat and poultry shop, a hat shop, a produce store, and a newsstand. The cobblestone street is crowded with people walking, shopping, talking, and enjoying the day. A moving truck and men with push carts make their way through the human traffic. Full of color and movement, the painting offers a vision of urban vitality and neighborly conviviality: the pleasures of the street. When you step out of the library on to State Street, you encounter a scene strikingly different from the bright animation of the painting. What was once the most densely populated area of the city is now mostly vacant land awaiting “redevelopment.” On the east side of the street, amid boarded-up storefronts and vacant lots, are a handful of small businesses—a laundromat, a pool hall, a sandwich shop, a liquor store, a grocery store. On the west side of the street, the two surviving Stateway Gardens high-rises—a ten-story building on State and a seventeen-story building on Federal—stand alone in the open space created by the razing of six neighboring high-rises. In and around the open-air lobbies of the buildings, the drug trade operates: a desolate marketplace in which only one commodity is sold. It is, at a glance, a gray landscape, as if shrouded in the dust from recent demolitions. Yet the pleasures of the street survive. Even in winter, when the weather relents a bit, South State Street comes alive. Yes, some customers hang out on the corner outside the liquor store. Street corner entrepreneurs sell “loose squares” (single cigarettes). And the librarians occasionally express concern about people obstructing the entrance to the library. (Beneath the painting in the vestibule evoking the street life of an earlier era is a “No Loitering” sign.) These chronic problems are present on the street, but so is the rest of life: much of the life of the community is played out on State Street. It is an intensely urban space, the place you go to get the news, to “meet and greet” and “conversate.” For many community members, it is a necessary perspective—a vantage point on life as it passes. There are people who gravitate to precisely the same spot on the street every day. Among them are some who looked on as Stateway was built and now are watching it being torn down. In this long abandoned neighborhood undergoing “transformation,” three key public institutions provide settings and venues for the common life of the community: the Chicago Bee Branch Public Library, the Chicago Park District facility at 3658 South State, and the public forum of the street. The State Street Coverage Initiative was launched on January 7, the day Morton Walker and Shawn Baldwin were arrested. 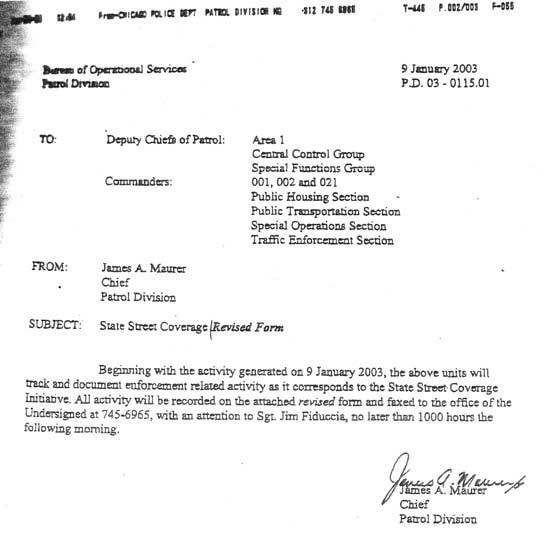 I have not seen the original order, but a subsequent memo from James Maurer, the Chief of Patrol Division, dated January 9 and dealing with reporting procedures for the operation, suggests its breadth. It is addressed to the Deputy Chiefs of Patrol of Area 1, the Central Control Group, and the Special Functions Group; to the Commanders of the 1st, 2nd, and 21st Districts; and to the Commanders of the Public Housing, Public Transportation, Special Operations, and Traffic Enforcement Sections. A memo from Commander Marienne Perry of the 2nd District to the personnel under her command provides more detail about the scope of the operation. 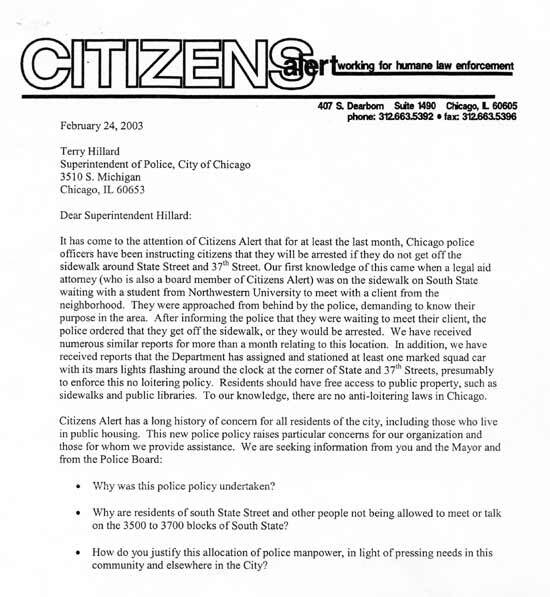 Commander Perry makes clear that the focus of the operation is “loitering.” The memo refers to the State Street “corridor”—words that used to evoke more than two miles of continuous public housing high-rises, stretching between 54th and 35th Streets and often described as the largest concentration of public housing (and of poverty) in the country. There were 28 buildings at the Robert Taylor Homes and eight buildings at Stateway Gardens. Today, after several years of demolition, there are five buildings at Robert Taylor and two at Stateway. The only active street life on the “corridor” is a small surviving remnant extending from 36th Street to the middle of the 3700 block. 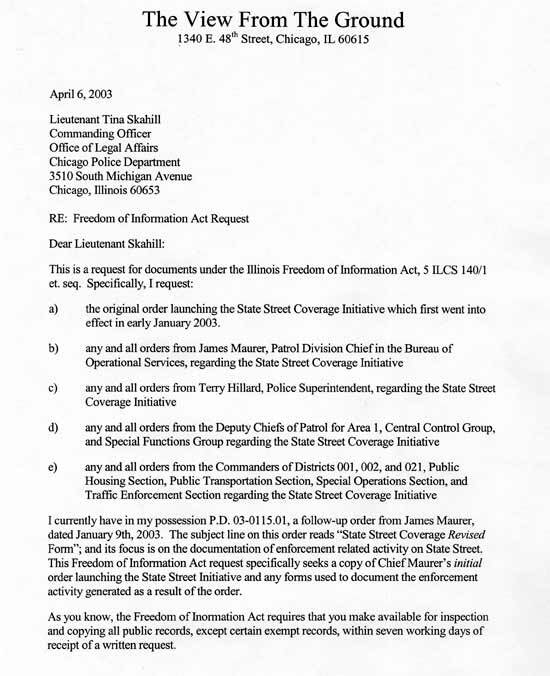 The memo makes clear that the operation is directed at State Street and “not Wabash or any other street that does not have disorder problems at the immediate point where it intersects State Street.” The focus of this coordinated police action is thus loitering on a block and a half of State Street in midst of a post-apocalyptic landscape in the dead of winter. According to the Perry memo, an extraordinary amount of police resources are to be deployed for this purpose. 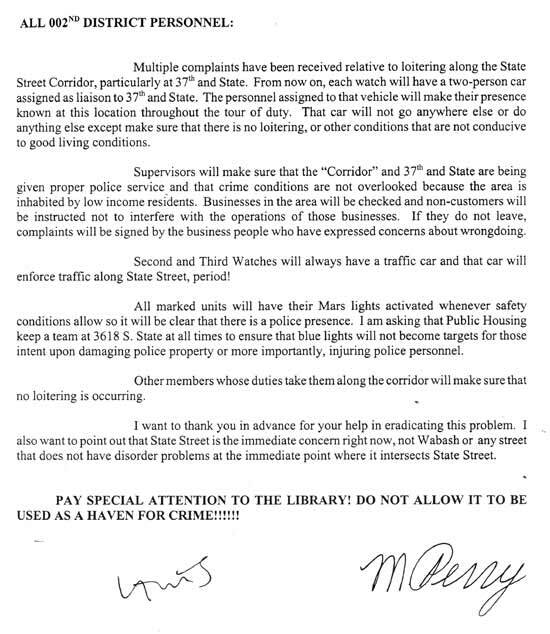 A two person car is to be stationed at 37th and State twenty-four hours a day with its blue lights (known as Mars lights) flashing. During the day, a traffic car is also to be stationed on State. All other 2nd District personnel—and presumably officers in certain other districts and sections of the CPD—are expected, if they are in the area and not otherwise engaged, to drive down State Street and make their presence known. Commander Perry also requests that the Public Housing Section keep a team stationed at 3616-18 South State twenty-four hours a day. In short, the presence of poor African-Americans on one-and-a-half blocks of State Street—the sight of which is said to have upset the Mayor—has been treated at the highest levels of the CPD as a major priority requiring the mobilization of multiple divisions. There appears to be considerable disaffection for this policy within the department. The only officer I talked with who was positive about the State Street operation was a crossing guard who, I suspect, welcomed having company at her lonely post. Some police personnel have said they hope citizens will complain about the operation. An officer in the Public Housing Section described it as “overkill.” It’s not a matter of law enforcement, he said, it’s a matter of “pleasing the boss”—the Mayor. Another said that the State Street operation undermined the efforts he and his colleagues have been making to build positive relationships with residents. During the first days of the State Street Coverage Initiative in early January, it was as if martial law had been declared on a block and a half of the South Side. There were uniformed officers on foot telling people to clear the street. Numerous arrests were made. Officers came into the Bee Branch Library and told the librarians to close the bathrooms. Police cars cruised up and down the street. On January 10, with temperatures in the low 20’s and heavy snow falling, I observed five police vehicles within one block: four squad cars with their Mars lights flashing and an unmarked car. Two of the squad cars, side by side and facing in opposite directions, blocked the entrance to the Park District facility (the site of a 2001 police raid on a basketball tournament that gave rise to a civil rights law suit currently in federal court). The unmarked car was parked on the sidewalk between the grocery store and the restaurant on the east side of the 3700 block. These were not uncommon sights during the first few weeks of the operation. Kate Walz arrived, accompanied by a Northwestern law student. At that moment, a squad car drove up on the sidewalk and ordered Kate and her companion to get off the street, to go into the library. Kate later reported that the law student, making her first visit to public housing, was deeply shaken. Today, some seventy-two days after the launching of the State Street Coverage Initiative, a squad car remains parked at 37th and State, but the operation is far less intense. It is more passive. Officers can be observed dozing and reading the newspaper. Sometimes it appears that the squad car—with its Mars lights blinking incessantly—is awake and its occupants asleep. It functions, in effect, as a four-wheeled scarecrow. The State Street operation is clearly winding down for the time being. But what will happen this spring, as the weather eases and more people come out on the street? In July, the Chicago White Sox will host Major League Baseball’s All-Star Game at the ball park across the expressway from Stateway now known as U. S. Cellular Field. As this occasion for the Mayor to showcase the city approaches, what will happen on State Street? Although Morton Walker no longer lives at Stateway, it remains part of him. He lives in Ford City now with a woman he knew as a child at Stateway. (They reconnected a couple of years ago at the “Back to the Community” street party held each August on South Wabash.) The building where he used to live—3517 South Federal—was razed last year, but his identity remains grounded at Stateway. What, I wonder, would Mayor Daley see, as his limousine rolled by, if he were to look out at Morton talking with a friend in front of the Bee Branch Library? Would he see a citizen of this City of Neighborhoods—a Chicagoan passionately attached to his roots? Would he see a devoted patron of the Chicago Public Library system? In any case, we know what the police officers who arrested Morton, acting pursuant to a policy that originated in the Mayor’s office, saw: an indigent black man talking with another indigent black man on a street the police had been directed to clear. Photographs of State Street taken between January 13th and March 1st, 2003. On Tuesday, January 7, Morton Walker and Shawn Baldwin went, as they often do, to the Chicago Bee Branch Public Library at 3647 South State across from Stateway Gardens. They are among the regulars at the Bee Branch. Both are 40 years old. Morton, who grew up at Stateway, was released from prison in 1999, after serving nine years of a twelve year sentence for criminal sexual assault. (The Illinois Supreme Court overturned his conviction and ordered a new trial; he accepted a plea bargain and immediate release.) Shawn, too, grew up in the neighborhood. Currently homeless, he stays at a nearby shelter. He and Morton became friends over the last few months, as they worked side by side at the computer terminals in the library and shared their knowledge of the Internet. One of the attractions of the Bee Branch, according to Shawn, is that “they have Dell computers with Pentium 4 processors.” The two men use the computers to check their e-mail, to search for jobs, and to explore the Internet. Morton likes to play chess on the computer. Shawn has a passion for the game SimCity. En route to the library the morning of January 7, Morton had an encounter with the police. He and a friend, Mike Fuller, were walking on State Street, when an unmarked police car driving on the sidewalk outside the grocery store at 37th approached them. Three plainclothes officers got out and ordered them to put their hands on the car. One officer checked their ID’s, while the other two searched Morton and Mike. The officers, Morton later learned, were from the Special Operations Section of the Chicago Police Department. The one who searched him was named Milton. “We thought it was because the president was in town,” recalled Morton. President Bush was to announce his plan for massive tax cuts before the Economic Club of Chicago at the Sheraton Hotel that afternoon. Morton asked Officer Milton whether that was the reason they were clearing the street. “There’s nothing over there but a bunch of drug dealers,” said Morton. Morton and Shawn were signed up for computers from 1:00 to 3:00 pm. At 12:50 pm, they stepped outside to share a cigarette—they had one between them—before beginning their computer sessions. As they stood in the doorway of the public library, Officer Milton and his crew drove up on the sidewalk, ordered them to put their hands up against the wall, and handcuffed them. Morton and Shawn tried to explain that they weren’t allowed to smoke in the library, that they had just stepped outside for a few minutes. “We got a place where you ain’t gonna be able to smoke,” said one of the officers. They were taken to the Second District police station at 51st and Wentworth, where they were held for fifteen hours. Arrested at 1:00 pm, they were not released until 4:00 am. While they were held, others charged with relatively serious crimes came through and were released. Fails to obey a lawful order of dispersal by a person known by him to be a peace officer under circumstances where three or more persons are committing acts of disorderly conduct in the immediate vicinity, which acts are likely to cause substantial harm or serious inconvenience, annoyance or alarm. 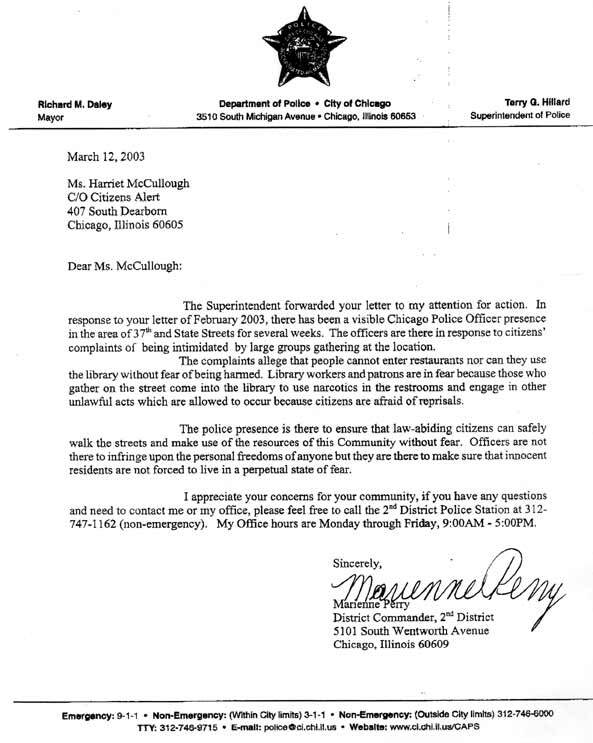 A/Os [arresting officers] observed Shawn Baldwin on several occasions loitering in the 3600 S State street area with several other male black subjects. A/Os did advise subjects to disperse several times to no avail. A/Os placed above offender under arrest. What is striking about this report is that the arresting officer makes no effort to present the offense—the acts “likely to cause substantial harm or serious inconvenience, annoyance or alarm”—as anything more than the presence of black males walking and talking on the street. Was that the crime for which Morton and Shawn were arrested: being black and poor and visible on South State Street? Since January 7, there has been a continuous police presence on the street—all three “watches,” around the clock, seven days a week. At times, I have observed as many as five police cars, with their blue lights flashing, deployed on the block-and-a-half stretch across from what remains of Stateway Gardens. Relocation and demolition have reduced this public housing community to two buildings—a ten-story building across from the public library on State and a seventeen-story building on Federal. The increased police presence has been directed not at the drug trade in the open air lobbies of the two high-rises but at the presence of community members on the street. Officers assigned to the State Street Coverage Initiative have been making arrests for loitering and giving tickets for jaywalking, within sight of open drug dealing. Conversations with police—from administrators to officers on the street—yield a remarkably consistent account of the origins of the operation: En route to or from a function somewhere on the South Side, Mayor Daley was driven down State Street. From his limousine, he saw people hanging out on the street. He did not see any police. Upset, he ordered Police Superintendent Hillard to clean up South State Street. The rationale for the mayor’s directive, as it was understood and filtered down through the ranks, was not to protect neighborhood residents from crime but to make the area attractive to developers. A week and a half after the launching of the State Street Coverage Initiative, Pete Haywood, was standing on State Street by the Stateway Gardens management office. A lifetime resident of Stateway, Pete is a member of the resident council and was most recently employed by the property management firm. A police car containing three white officers drove up. “What are you doing standing there?” one of the officers asked. Before Pete could respond, the officers continued. The headquarters of the Chicago Police Department as seen from a ninth floor apartment in 3542-44 South State Street, a recently demolished high-rise at Stateway Gardens. Chicago Housing Authority representatives constantly sound the theme that public housing residents are citizens of the City of Chicago with equal claims on the services available to other citizens of the city. This attractive proposition resonates to principles of justice and equality. It evokes a new day for public housing communities long abandoned by the institutions funded to serve them. It has also been employed as the rationale for shifting resources intended for CHA residents to other city agencies. In the area of public safety, the CHA by the end of 2003 will have transferred $49.6 million to the Chicago Police Department. As of the end of 2002, $36 million had been transferred. An additional $13,600,000 for 2003 was approved by the Board of Commissioners at its November 19 meeting. The resolution notes various services covered by these funds: “a customized policing plan for the Authority”; “enhancement of the Public Housing Section of the CPD”; “increased vertical foot and car patrol teams”; and “concerted patrol efforts within targeted developments.” It also notes the need for additional manpower “to address concerns relating to relocation.” But the basic logic is that these are supplemental services provided in addition to the police services public housing residents receive as citizens of the city. This statement—which describes a condition of affairs dramatically different from what I have observed and learned—is especially troubling because it is included in an official, formal CHA document, presumably written after thoughtful consideration; the CHA response was sent to me more than three weeks after Report No. 3 was issued. What are the realities of policing in public housing? What do the “supplemental police services,” paid for out of the CHA budget, look like on the ground? What are the public safety needs of public housing communities and how might they best be met? What is the proper role of law enforcement as these communities are “transformed” into mixed income developments? In a forthcoming series of articles, The View will report on the policing of public housing as we have observed it at Stateway Gardens. It is unlikely that the patterns of police conduct—and misconduct—described in this series are unique to Stateway. Presumably, similar patterns can be observed in public housing developments and other abandoned communities throughout the city. If anything, one might expect fewer flagrant abuses at Stateway, in view of the fact that it is located two blocks away from the administration headquarters of the Chicago Police Department.